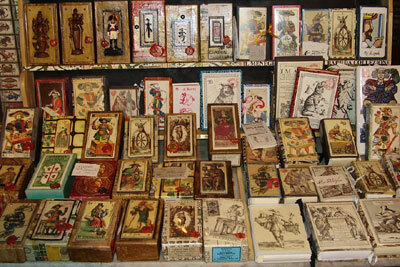 Most readers use one or two (okay, or three or four) main decks for readings. Some offer a choice to the client who then chooses a deck based on familiarity with the deck, or (like moi) because the cards are pretty. 😉 But what would happen if a client brought in her/his own deck and asked a reader to use that deck? We asked what The Green Man psychic readers think about working with different tarot decks and got quite a variety of answers! The answer is a big Nope! First and most importantly, I have a relationship with my deck. We speak to each other fluently and in a daily basis. Reading with someone else’s deck would be like me having a conversation in a language I hardly ever speak. It wouldn’t give the client the same quality and feel of a reading that I normally give. Second, the deck they bring in had a relationship with THEM, not me. It would (or at least should) be fluent with their energy and be programmed to connect with them. Third, I love my deck (Deviant Moon), it makes me happy, and has been so patient with all the (sometimes silly) questions it gets asked everyday. I’d feel like I was cheating on it. I think it would be interesting , because the truth is if the reading is correct any deck would show it so I would try it. Personally, I wouldn’t enjoy using someone else’s deck they brought into the store, because I don’t prefer to let clients use my deck. I feel like tarot cards tend to have an intimate bond with their reader. So sharing decks would be like…sharing underwear, or maybe a toothbrush (if I knew the person very well, then maybeeeeeee). I have one deck that I do my vast majority of reading from, the Wizards Tarot, but if someone wanted me to read from their deck, that would be fine. In my Tarot classes, I teach my students to be flexible and read from other decks. It allows for a deeper connection with our intuition. And sometimes another deck will have a specific image that reinforces a certain direction for one to move towards. One for instance was a card that had a cobra on it, that suggested a healing, yet mesmerizing energy. That person was headed towards a career of being a medical hypnotist. I’ll pass on that, I keep my own decks because they resonate with my energy and there’s a connection so I wouldn’t read with my client’s deck. Yes, I’d read it, same as I’d read a a book someone gave me or a magazine in a waiting room at a doctor’s office. I believe the beauty of Tarot is that it’s a tool for knowledge and information; a universal language… but then, I’m the kind of person who’ll see a playing card laying on the street and read that, too! Some people are very picky about having others touch their decks or handling decks that belong to another person, but not me. The only time I might not read a deck that a client brought in would be if they brought in oracle cards that they *thought* was a Tarot deck and they wanted a long reading. In that case, I’d use my own cards, and incorporate the client’s cards into the session as supplemental information. It would really depend on the situation and the deck. I can get an intuitive read from almost any deck however I get the strongest messages obviously through my own. I feel we all have personal connections to the energies of the images in the specific deck we chose and bond with but I might be open to trying someone else’s deck if I felt a pull to it. By the same token if Spirit said NO, I’d heed that as well.